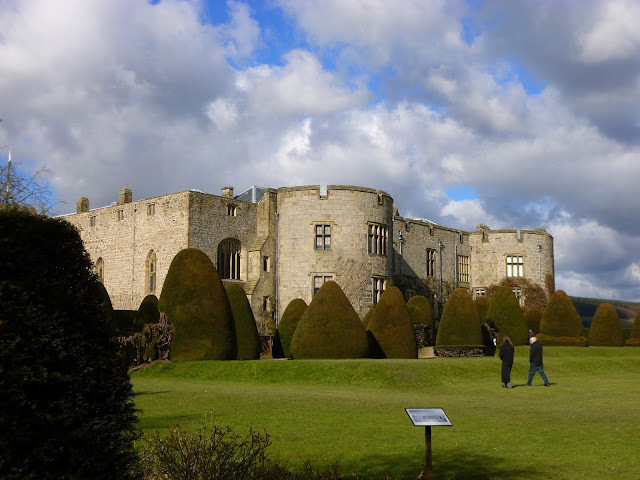 On Sunday, small daughter and I bundled ourselves up in our warm clothes and headed to Wrexham in Wales to visit Chirk Castle with small daughter's friend and her family. Small daughter's friend's Mum asked if we'd like to go with them because they were going to see if they could find Offa's Dyke, a huge earthwork which was roughly follows the borders of England and Wales. The girls had been learning about the King of Mercia in school and small daughter had said that if they were ever going to visit, she would like to go too. Isn't it great when you discover what your children are doing at school from another parent? 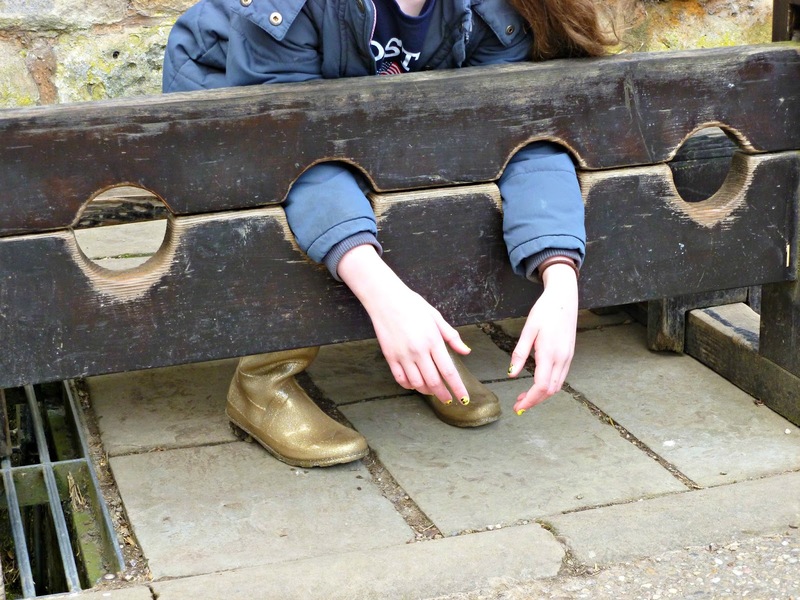 Trying to get any information about what she's done at school out of small daughter is like trying to get blood out of a stone, so I was more than a little surprised when she chatted away in the car about what she knew of King Offa. But more of that later ... this was our first view of the castle from the car park and the children were keen to head up the hill to explore. We rounded a corner of the steep path up towards the main entrance, the Welsh flag snapping in the wind and the sky the most brilliant blue. The view from the top was amazing - far-reaching views across the landscape from any part of the gardens. It certainly is an excellent place to build a castle, and Chirk was one of several fortresses built along the Welsh borders to keep the Welsh under English rule - there would be little chance of anybody sneaking up without being seen (and without being seriously out of puff because that hill is steep!). 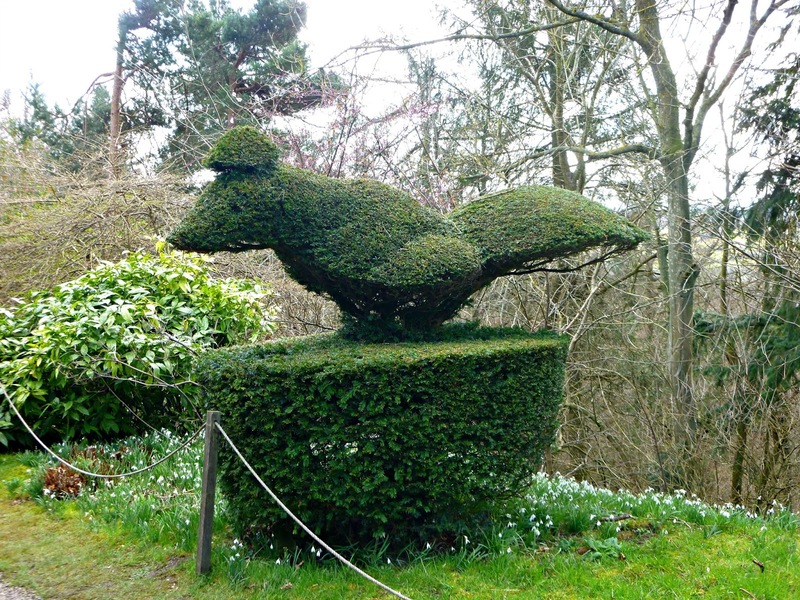 lots of hilarity over under-dressed statues and debate about what this particular piece of topiary actually was. I thought it looked a bit like a squirrel, or maybe Basil Brush, but we also thought it could be a mouse, a seal or a pheasant. Perhaps. If you half-close your eyes and move past it at some speed. 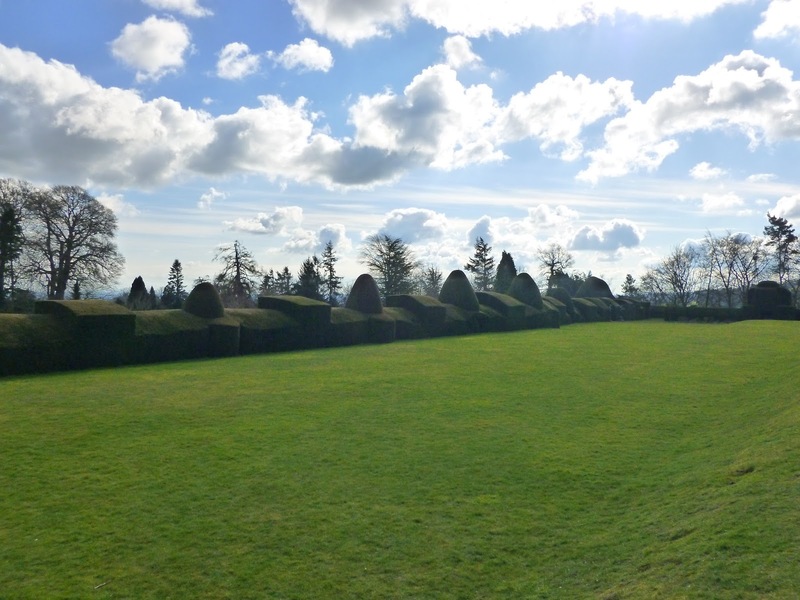 The topiary at Chirk Castle is fascinating. 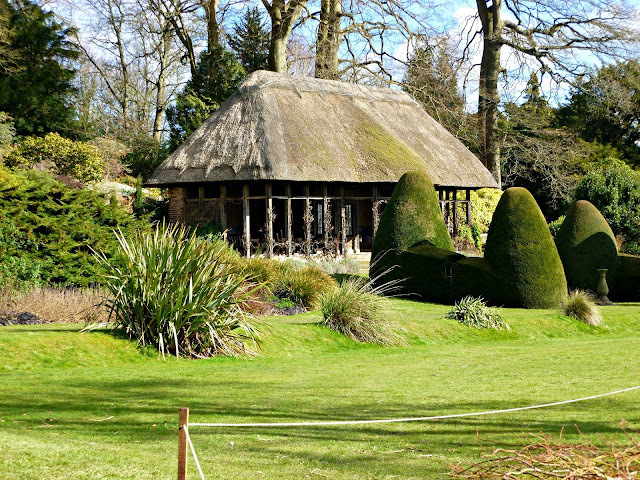 The yew trees that the shapes are formed from are around 130 years old and so closely cut that they look like velvet from a distance. There were turrets, domes, a crown on a cushion, Basil Brush ... I can quite believe it that it takes 6-8 weeks to clip all the hedges each time they need cutting. What I didn't know, though, is that the clippings are processed to make chemotherapy drugs. That's seems quite incredible to me, and rather fabulous at the same time! 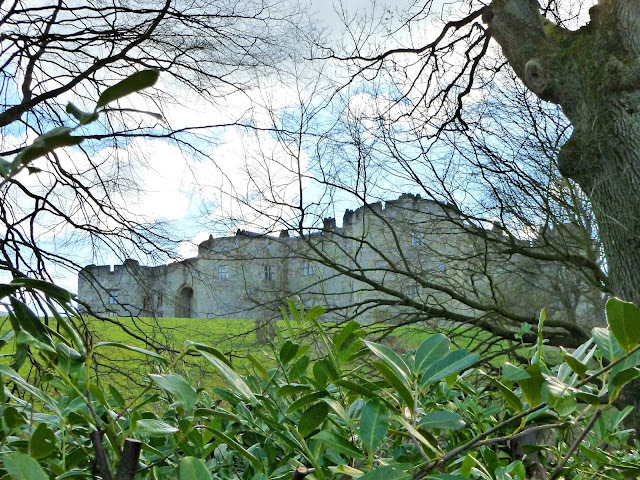 Everywhere you look, there is either a view across the open countryside or a view of the castle. We found a large tree that had fallen and been carved by a renowned wood sculptor. 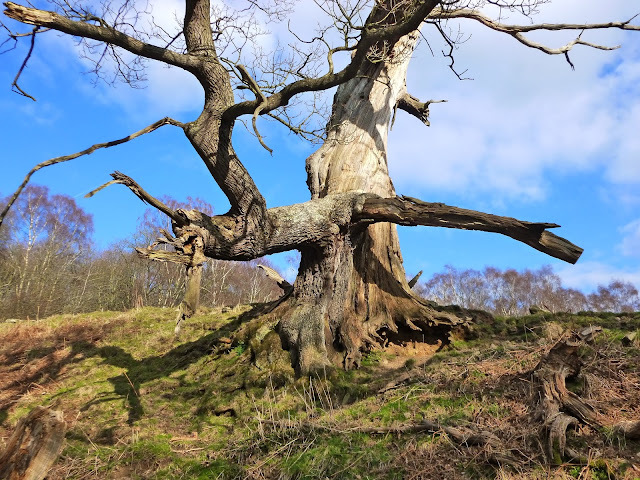 Apparently this Lebanese cypress tree had been 200 years old by the time the winter winds brought it down and the castle owners were reluctant to let its existence go by uncelebrated. The bench that was created from part of the trunk commemorates the First World War - we had to go and take a closer look as from a distance, we thought it looked like there were real stone blocks balanced on the wood. Even close up, we had to look closely to see that it really is all made of the trunk of the tree. The gardens were a bit sparse, as you'd expect at this time of year, although there were a few spring flowers beginning to emerge and one or two trees with blossom on them, and a carpet of new Stachys leaves in one of the borders. 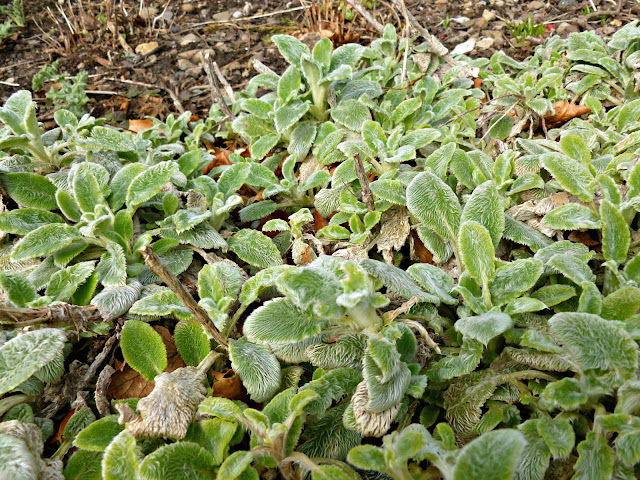 It reminded me that I must go and check whether my Stachys plant has survived the wet winter. 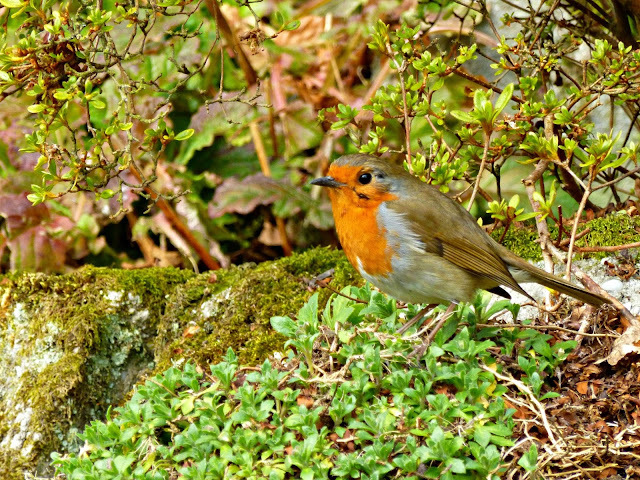 No garden is complete without a robin or two, and there were more than a few hopping about. They're fearless little birds, obviously well-used to the visitors. I think they're one of my favourites so I'm not going to apologise for having another picture of a robin in a blog post! A bit further on, we found this pretty shelter which seemed like the ideal place to have our picnic. We managed to persuade the children to put down their arms and stop for long enough to eat a few sandwiches. We had quite a collection of swords and shields between us (some of which weren't relinquished, even whilst eating a sandwich!) and we were pretty prepared for any unexpected medieval eventualities. 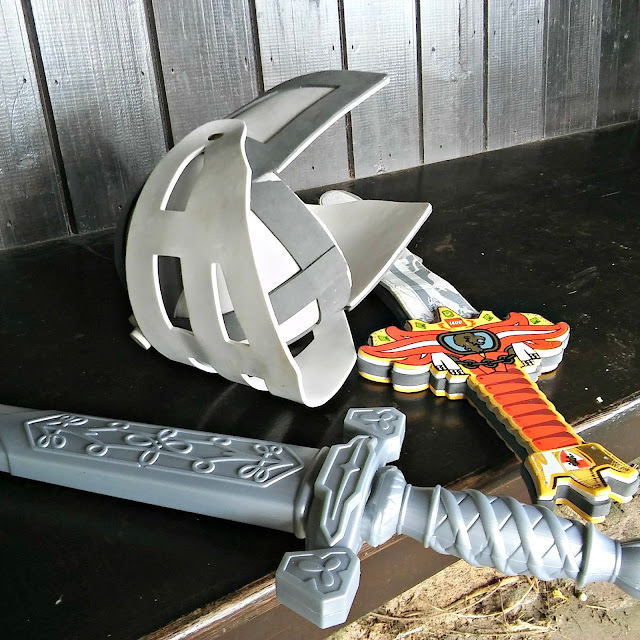 You can't go to a castle unprepared. 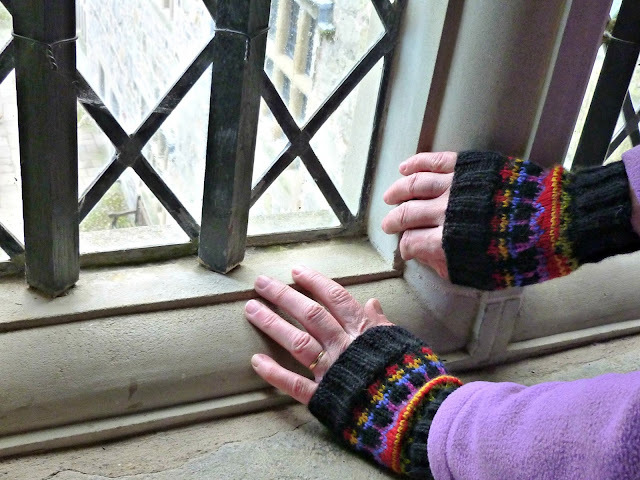 Unless you're me, that is - I looked at the beautiful blue sky and the winter sunshine and decided to leave my mittens in the car and wear my new wrist warmers instead. This turned out to be a mistake, even when we had finished our lunch and went into the old part of the castle which turned out to be only slightly warmer than being outside. My wrists were indeed very warm but my fingers were absolutely freezing and any attempts at an artful pose to show off my new woolly accessories were quite difficult as I just wanted to keep my hands in my pockets! 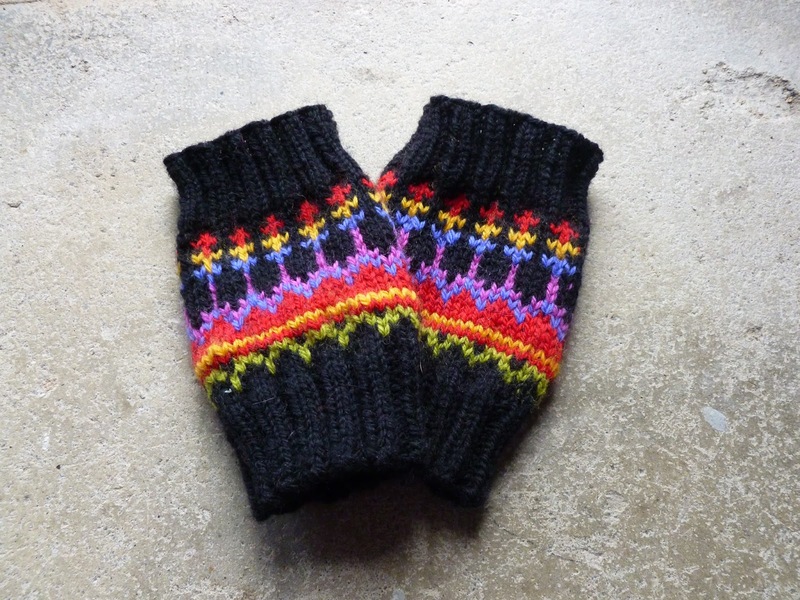 Here they are without my hands in them - I do like them very much and I love the bright colours against the black, but I think I'll stick with my mittens for a bit longer! Outside, small daughter found the stocks and wanted to try them out (cue pretend vegetable-throwing and not-so-pretend poking with swords) but by now it was too cold to be hanging around so we declared her freed and went to see what else we could find. 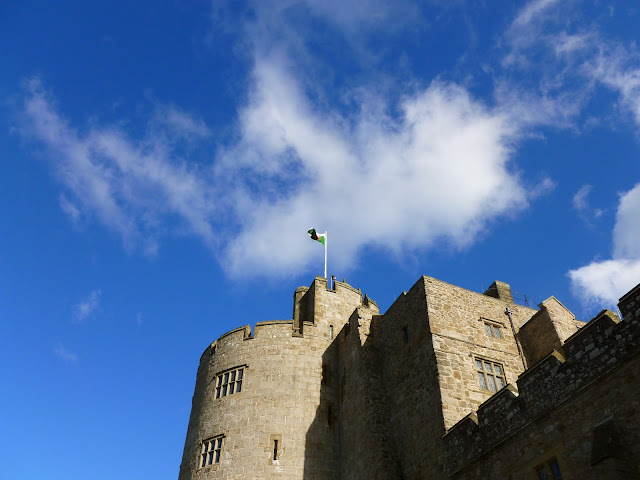 We took a quick look around the more modern part of the castle and listened to a Welsh male voice choir who were performing in a concert to celebrate St David's Day (a couple of days early) but the children were anxious by this time to see if we could find Offa's Dyke so having warmed ourselves up, we headed back outside. King Offa, so I was reliably informed by small daughter in the car, was King of Mercia in the late 700sAD. 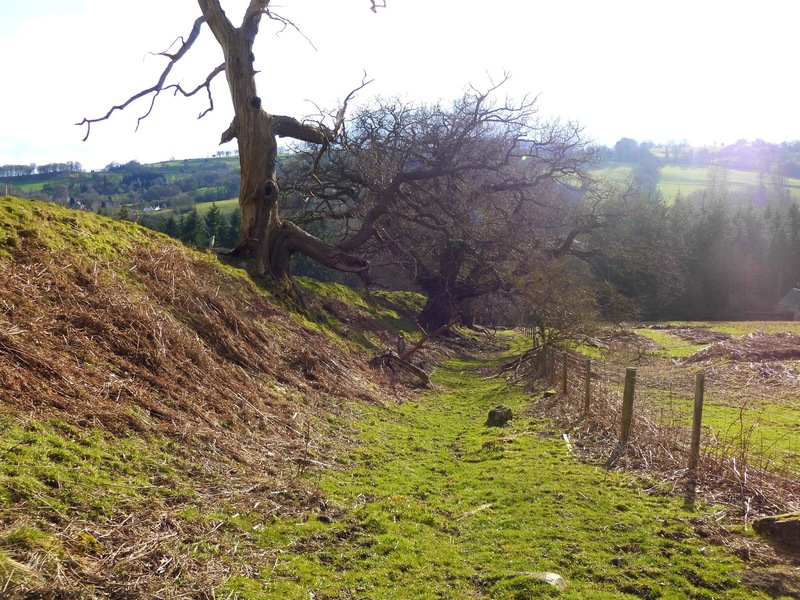 He built the Dyke, which is basically a giant ditch with the earth piled high on the English side, to mark the boundary between England and Wales and it stretches for around 120 miles. 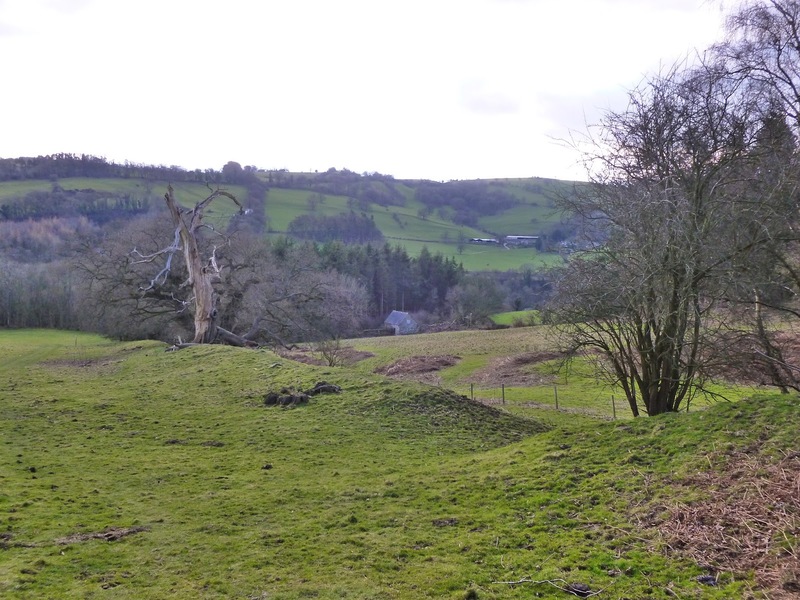 We followed a footpath down from the castle and into a field - and there it was before us - an earthwork built some 1200 years ago just there in a field for us to walk to up and see. 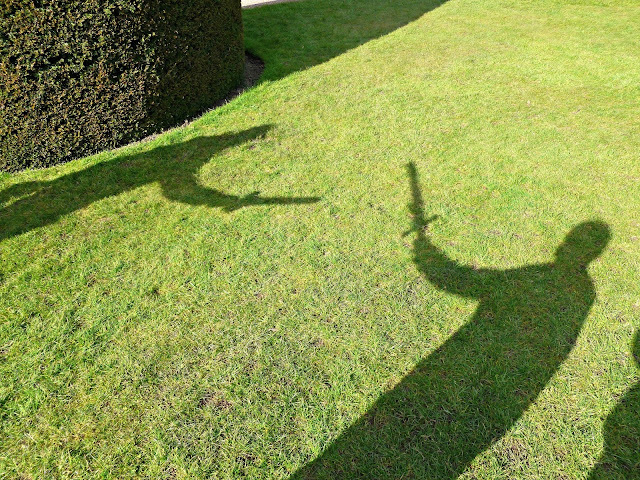 And, if you were a small person, run up and down waving your sword and making fearsome warrior noises. At first we wondered if we had actually found the right place - there are no signs or any kind of indication that this really is Offa's Dyke, but some walkers confirmed it for us with their map, and you can tell by the trees that this is an ancient place. It all seems so peaceful, and although no one really knows what the purpose of the Dyke was, the fact that it is there at all brings comparisons with Hadrian's Wall, supposedly built to keep the barbarian Scots out of England. Did Offa have the same thoughts about the Welsh? 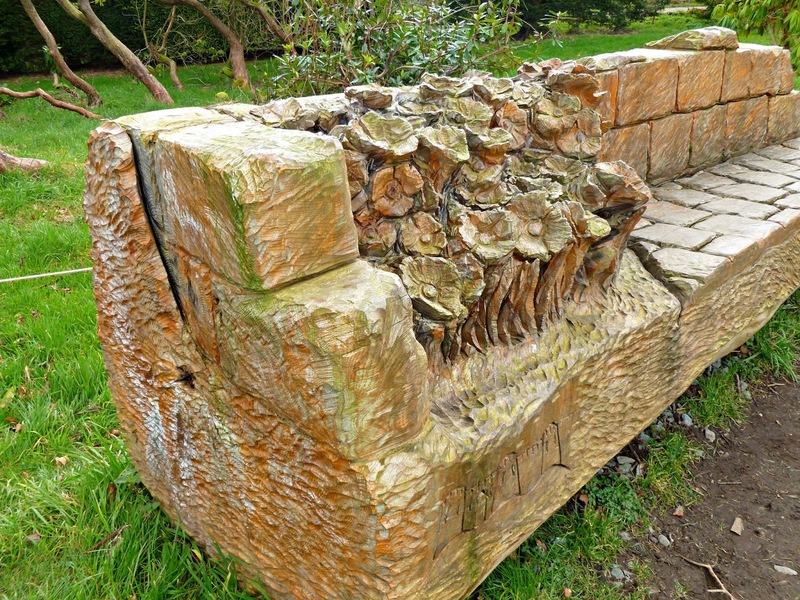 There are differing views about whether Hadrian's Wall had more of a commercial purpose as the only access points were through gateways which could have involved a toll, but there are no records for Offa's Dyke so we have no way of ever knowing. 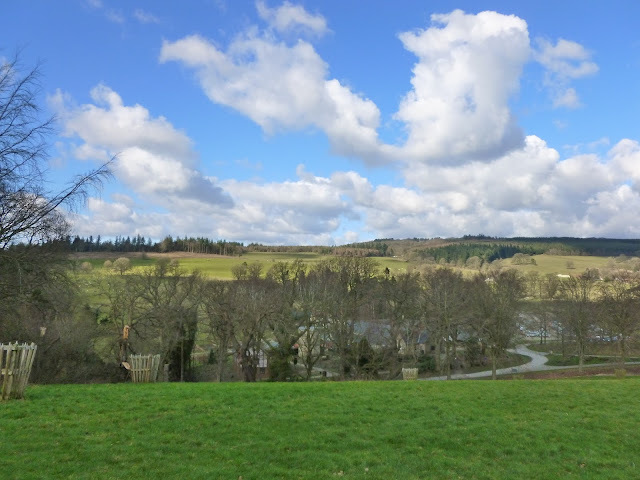 As we walked back up the hill to the car park, I took a last look back. Who knows what secrets these fields keep? History is magic, and I am delighted that it seems to have cast it's spell on small daughter too. What an amazing place, steeped in history. I find places like that fascinating and I love when children do the same. 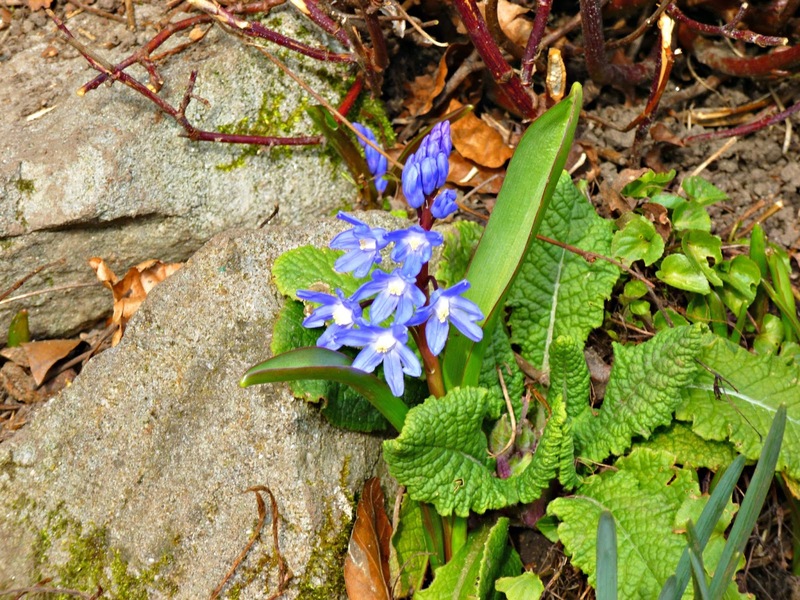 Thank you for sharing these wonderful pictures with us. 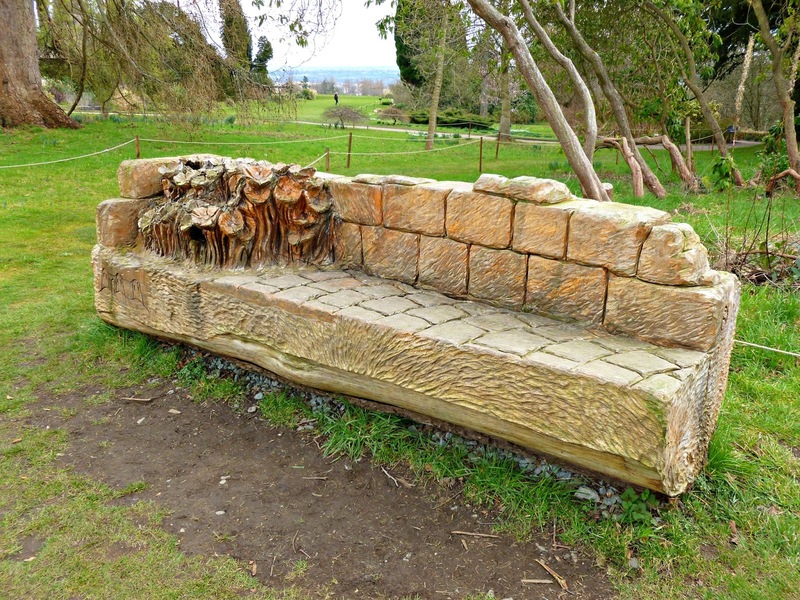 The bench made out of a tree trunk is amazing. A lovely post. We live on the Welsh side of Offa's Dyke, about 30 miles into Wales and I know that area well. Chirk Castle is a fascinating p[lace to visit and Offa's Dyke is stupendous.